Some of the birds in the world’s only remaining wild population of Whooping Cranes have begun their annual migration back to their nesting grounds in northern Canada. Staff and visitors at the Quivira National Wildlife Refuge counted 29 of the birds on Monday. The others will follow soon. They are repeating an event that has been going on for thousands of years. Following good conditions during the winter season on their Aransas National Wildlife Refuge winter grounds, the Whoopers appear to be in healthy condition. So, as the remaining Whoopers join the early birds and depart on their 2,500 mile migration to Canada’s Wood Buffalo nesting grounds there is hope for a successful reproduction and nesting season. Traveling in small groups the Whoopers are expected to begin arriving at the Wood Buffalo National Park nesting grounds during late April and May. Whooping Cranes in Flight. Photo by Charles Hardin. Friends of the Wild Whoopers ask the public to report any Whooping Cranes they see along rivers, wetlands and fields. Report your observations to the wildlife agency in your state. If you see a whooping crane in Nebraska, please report your whooping crane sighting to Nebraska Game and Parks (402-471-0641), U.S. Fish and Wildlife Service (308-379-5562), or The Crane Trust’s Whooper Watch hotline (888-399-2824). Emails may be submitted to joel.jorgensen@nebraska.gov. If you see a whooping crane in North Dakota, please report your whooping crane sighting to, U.S. Fish and Wildlife Service offices at Lostwood, (701) 848-2466, or Long Lake, (701) 387-4397, national wildlife refuges; the state Game and Fish Department in Bismarck, (701) 328-6300, or to local game wardens across the state. 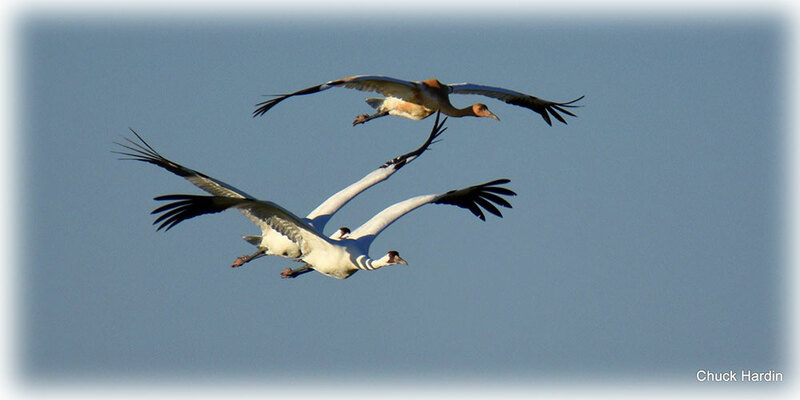 The Oklahoma Department of Wildlife Conservation is asking for your help in logging the migration path of the cranes. Sightings can be logged online here or by calling Endangered species biologist Matt Fullerton at 580-571-5820 or wildlife diversity biologist Mark Howery at 405-990-7259. Texas Whooper Watch also has a project in I-Naturalist that is now fully functional. You can find it here. You can report sightings directly in I-Naturalist via your Smart Phone. This allows you to easily provide photo verification and your location. If you are not a smart phone app user, you can still report via email: whoopingcranes@tpwd.state.tx.us or phone: (512) 389-TXWW (8999). Please note that our primary interest is in reports from outside the core wintering range. Should you see a whooping crane, please do not get close or disturb it. Keep your distance and make a note of date, time, location, and what the whooping crane is doing. If the whooping crane is wearing bands or a transmitter, please note the color(s) and what leg(s) the bands are on. You may wonder why the wildlife agencies are asking for these sightings to be reported. The reports are very helpful in gathering data and information on when and where the whooping cranes stopover, what type of habitat they are choosing, and how many there are. With just over 500 wild whooping cranes migrating along the Central Flyway, odds are low of seeing a wild whooping crane. However, FOTWW hopes that someone reading this article will be one of the lucky few and if you are, please report your sighting so that these agencies and other conservation groups, including FOTWW can continue helping these magnificent cranes. Good afternoon. This morning at around 10:00am, April 22, 2019, I spotted a flock of what I think were 14 whooping cranes (13 white coloured and 1 a darker colour) flying northwesterly fairly low over our farm. There were not any sandhill cranes in the group. I cannot confirm my sighting because I didn’t get a detailed look at the birds, however 13 birds were white with black wing tips, 1 bird was a mottled body colour with black wing tips, and their sound was similar to that of sandhill cranes. My farm is located 19 km northeast of Strasbourg, Saskatchewan, Canada, and in the vicinity of the Last Mountain Lake national migratory bird refuge. Thank you James Hoffman for your observation. It is greatly appreciated.